A "promising" teenage rugby player was run over by a gang who beat him with a golf club in what police described as a racially-motivated attack. Police said Littleborough RUFC player Matthew Hayden, 17, suffered a fractured skull in the "unprovoked attack" in Smithy Bridge Road, Littleborough, Rochdale, on Saturday. The attackers - described as a group of up to five Asian males - shouted racial abuse during the assault, police said. It is being treated as a hate crime. Littleborough RUFC said Colts junior team captain Josh Jones's car was rammed by a black Nissan Micra driver at 02:00 BST. When Matthew got out of the car, the other car hit him and he was then struck on the head with a golf club, police said. 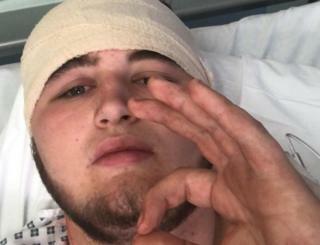 Mr Jones, 18, who was trapped in the driver's seat, was also attacked with a crowbar, causing "significant hand and facial injuries", said Littleborough RUFC. A third passenger in Mr Jones's car escaped unharmed, said the club. The attackers fled towards Hollingworth Lake, police said. In a statement, the club said the trio were "all relieved to be alive", adding Matthew has undergone surgery on a fractured skull and a bleed on the brain. It said he would now be unable to take up a scholarship in America this summer. His family, who described the player as "caring, loyal with a gentle nature", said he had been "so excited" to be offered the scholarship and was "now devastated it has been taken away from him". Det Insp Mark McDowall of Greater Manchester Police described the attack as "brutal" and "unprovoked", leaving Matthew with "life-changing injuries". He described the offenders as being four or five Asian males, of thin build and either in their late-teens or early-20s. The club said it was "saddened and offering support to the pair of promising stars" who made their debuts in the senior team this season, as well as playing in the junior squad.